Exhibition event tent rental is an emerging industry because it ensures the exhibitions impacted from weather factors in an ideal place. What’s more, tents need to be set up for use in the exhibition period only. Nowadays, what we need to be concerned among lots of exhibition tent rental companies? Several key factors which play an important role including the staffs for tents set up, routine maintenance and durability. First, all the exhibition tent rental company should be equipped to build a team with capable staffs. They can set up any size tents from their own company varied from pagoda tent for small party to large tents to housed hundreds of people. It not only ensures the proper and safe installation for mobile tents but also can reduce the time for tent setting up. LIRI’s engineering team have been serviced the Canton, Auto exhibition and other large-scale exhibitions many years and able to set up thousands of area in square meters efficiently and correctly. In addition, we are flexible enough to ensure the tents set up process under a variety of adverse weather. 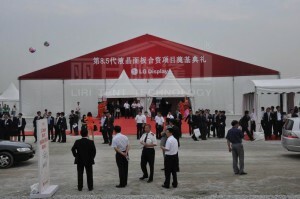 Secondly, it is required to have regular inspection and maintenance immediately after the exhibition tents usage. It need to be checked whether there is tarp break or tear and cleaned stains on PVC surface. Break tarp on cover will not only affect the structural strength, but also let the rain into the tent which will affect the normal exhibition activities. PVC should be cleaned even if only a little dirty on tent surface. Moreover, it should have the breach repaired as soon as possible. Last but not least, durability is one of the significant factors for rental tents. It can save time and money with the durable tents. As high-tech enterprises in Guangdong Province, LIRI Tent insist to apply highest quality materials to create the highest quality tents. In normal usage, lifespan for LIRI’s PVC fabric is 5-8 years and 15-20 years for aluminum frame.